Grace Matters (Formerly Lutheran Vespers) is the offical radio program of the Evangelical Lutheran Church in America. The Lutheran Hour is the offical radio program of the Lutheran Church-Missouri Synod. This is the longest running Christian program on the radio, it is currently celebrating 75 years on the radio. The Lutheran Hour is the premier Lutheran program on radio. Worship for Shut-Ins is produced by Lutheran Ministries Media, Inc. It is based out of Fort Wayne, Indiana and is a weekly television show made particularly for shut-ins who cannot attend a worship service for that Sunday morning. Davey and Goliath is a Lutheran sponsored childrens program. 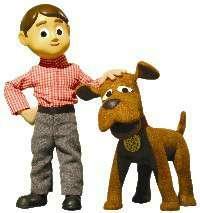 The show features situations where with belief in God, Davey and Goliath can get out of any trouble they encounter. It is aired on TBN on Saturday mornings.